Mel Torme was a child actor and musical prodigy. He began singing at the age of three, studied piano and drums, and at 15 published his first song which was recorded by Harry James. In 1942 he joined the band of comedian Chico Marx as drummer, singer, and vocal arranger, and in 1943 he formed his own group, the Mel-Tones, and appeared in his first film, Higher and Higher, with Frank Sinatra. The Mel-Tones, a precursor of contemporary vocal jazz, were popular during WWII and enjoyed several hits on their own as well as with Artie Shaw’s band. In 1947 Torme began a solo career, recording popular songs in his smooth-as-satin voice which reached into both the baritone and tenor range, performing in the best clubs, and appearing in films. His version of “Blue Moon” from the film Words and Music (a fictionalized biography of the Richard Rodgers/Lorenz Hart partnership) topped the charts in 1949, and he picked up the moniker “The Velvet Fog.” By the 1950’s he gave up crooning and turned to jazz, recording some of his most memorable work with the inimitable arranger Marty Paich and top West Coast musicians. Torme’s perfect intonation, enviable range, sensitive phrasing, and improvisational ability brought him great acclaim as a jazz singer. But he was also recognized as an actor, earning an Emmy nomination for his 1957 role in “The Comedian” on TV’s Playhouse 90. As jazz began to lose favor in the ‘60s, he recorded a few crossovers hits, to the chagrin of his jazz fans. From the ‘60s through the ‘90s he appeared on dozens of television shows as both performer and actor: “The Judy Garland Show,” Johnny Carson’s “Tonight Show,” and nine episodes of “Night Court.” He followed a rigorous schedule of personal appearances that took him from Las Vegas to London, where in 1977 he recorded with a symphony orchestra, a session which he called his personal favorite. His recording career gained momentum when he won two Grammys for his 1982 and 1983 recordings with George Shearing. Torme was also a composer and writer. His most famous composition with lyrics by Bob Wells is “The Christmas Song” which Nat “King” Cole took to the charts in 1946 and which Torme didn’t record until later in his career. It is ASCAP’s most performed holiday song of the 21st century. 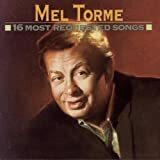 Torme also wrote “Born to Be Blue,” a song cycle called “California Suite,” “Welcome to the Club,” and “County Fair,” which appeared in the 1949 film So Dear to My Heart. His six books include an autobiography, It Wasn’t All Velvet; a book on drummer Buddy Rich, Traps, The Drum Wonder: The Life of Buddy Rich; and a book on his vocal influences, My Singing Teachers. Torme was a force in popular music for over sixty years, a consummate professional who maintained his vocal prowess until he suffered a stroke in 1996.